When Dr. Yousry Sayed founded Quality Chemical Laboratories in 1998, he envisioned more than a business to serve the pharmaceutical industry. He saw a way to continue educating others. Dr. Sayed was a longtime faculty member in the chemistry and biochemistry department, a student mentor and the former director of the General College, now known as University College. Quality Chemical Laboratories employs about 200 people, including many UNCW graduates. 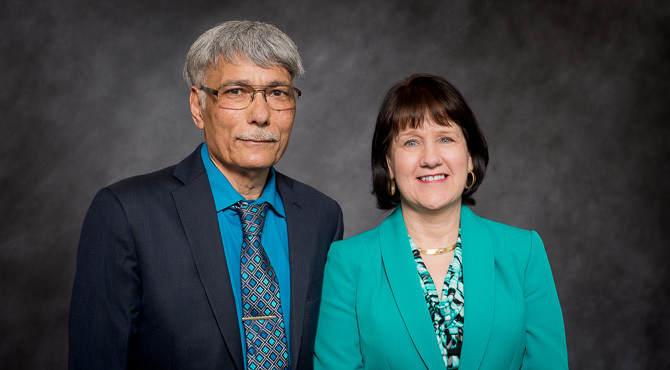 To help supply a trained workforce for the growing pharmaceutical industry, Dr. Sayed, his wife, Linda, and Quality Chemical Laboratories have committed a $5 million gift – $1 million per year for the next five years – to the university to support the development of new programs related to pharmaceutical sciences and chemistry. The new programs will build on the strengths of chemistry, biochemistry, biology and marine biology within the College of Arts and Sciences at UNCW. The gift is the largest outright philanthropic commitment by a corporate donor in UNCW’s history. It is anticipated that the gift will be used to establish distinguished professorships and endowed support funds, potentially funding student scholarships, instrumentation and equipment for faculty research, seminar series and travel opportunities. Dr. Sayed has been passionate about student success since his first day of teaching at UNCW more than 40 years ago. Linda Sayed is also no stranger to education. She was a chemistry teacher at John T. Hoggard High School, where she helped start the school system’s Advanced Placement Chemistry Program. She was later an assistant principal in New Hanover County Schools. She also taught chemistry labs at UNCW and worked at the Science and Mathematics Education Center, now known as the Center for Education in Science, Technology, Engineering and Mathematics (CESTEM). The same year Dr. Sayed started Quality Chemical Laboratories, Linda Sayed began law school at Campbell University. “He suggested pharmacy school first, but I thought that was the most awful idea,” she said with a laugh. Linda Sayed has been a family law specialist for the past 15 years. She is a partner with the firm of Block, Crouch, Keeter, Behm & Sayed, LLP. She was admitted to practice before the U.S. District Court for the Eastern District of North Carolina in 1999 and the U.S. Court of Appeals for the Fourth Circuit in 2000, and she is also a state-certified family financial mediator. The Sayeds are grateful to be able to help advance the university’s mission. There is no other organization they feel more dedicated to than UNCW, they said.